If you’re looking to hit up some of London’s best brunch spots at the weekend, look no further as we’ve compiled a little list of some of our favourites cafe’s around London. We’d like to think that we’ve got South & West London covered with our lovely cafe in Battersea serving up well-sourced, delicious and seasonal brunches alongside great coffee and fresh juices. The latest addition to the Autumn menu include our brilliant homemade carrot cake granola – served with thick yoghurt and seasonal berry compote. As we move westwards, you’ll find our new restaurant Soane’s Kitchen in Ealing, located within the stunning grounds of Pitzhanger Manor. 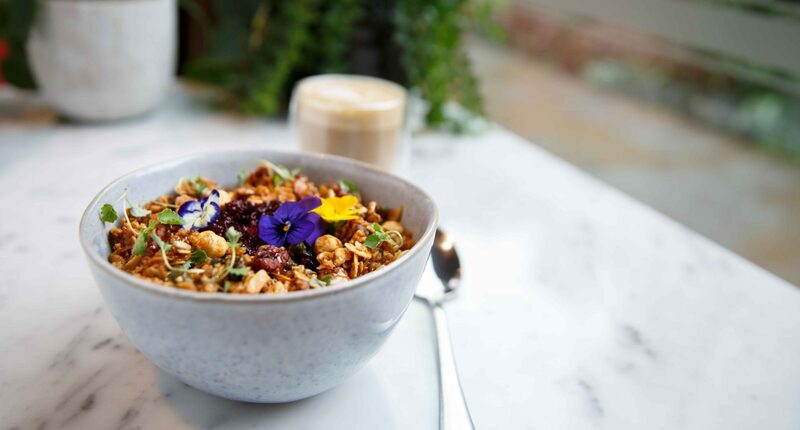 If you’re after a sweet fix, there’s plenty of options like Soane’s granola with honeyed yoghurt; smoothie bowls with super seeds and stacks of sweet potato pancakes. If you’re more of a savoury person, why not try the classic smoked salmon, avocado and poached egg on rye bread; a full English breakfast with Ginger Pig bacon or an indulgent brunch hybrid of an eggs Benedict croissant with rocket. See what About Time had to say on the matter by checking out their latest post here. If, however, you’re looking for more of a grab-and-go brunch option then head down to Pitzhanger Pantry in Walpole Park, where you can find delicious bacon baps, take away salads and great coffee among other mouthwatering options. As we work our way around the compass to East London, we love the Attendant in Shoreditch for their principles which resonate so much with those of Social Pantry. Serving great coffee along with a local, fresh, produce-driven and seasonal menu. We couldn’t forget one of our favourite central London cafes, Redemption Roasters, who we have a strong relationship with as we use Redemption Roasters coffee beans across all of our sites. Their key mission is to help young offenders successfully reintegrate into society, by training them in professional roasting and barista skills. And lastly, we love what 26 Grains in central London have to offer with a varied and delicious brunch menu to suit every taste and located in cute Neals Yard, just off the beaten track. Where are your favourite places to kick back and enjoy brunch?